Inspired by this man, when I was sixteen years-of-age I took “Malcolm” as my middle name. This is my homage as I envision him at the Mosque of Mohamed Ali at the Citadel of Salah Al-din, Cairo, Egypt shortly before his assassination the following year. Hi Ed, I finally found(or took)the time to explore your website. I am impressed with this piece, as Malcolm X was very influential to me during the 60’s and 70’s; particularly respective to the energy and changes taking place during those periods of time. I named my one and only child Malcolm Ruchell Jones, after the great Malcolm X. My son was also an artist and a rebel, following the beat of his own drum. But I won’t get into my story, as this is about your art work and this particular piece. I like the way you placed the lights around Malcolm’s head, very bright and very visible lighting. They represent(to me)the great ideas, or energy, going on in Malcolm’s head or being. I like your skill and technique. The lights look like colored pencil to me. But I know it says it’s acrylic. I will visit again when I take more time to do so. This time it will be sooner, than later. I don’t know if you remember me. I’m the woman that walks the dogs past your house frequently. Two of the dogs are mine, and the other two belong to Kelly. She was with me this past Sunday. We stopped and talked to you and Tica. I have an appointment now. I must go. Thank you for your website. Eileen, thank you so much for visiting and your kind comment. Of course, I remember you. Teca and I see you quite often. I have used “Malcolm” as my middle name since I was sixteen, although it’s only been “legal” and “official” for several years now. (That’s a story in itself, which I’ll relate in a blog post of its own sometime, one that is so contemporary that it relates to 9/11. In fact, I have two blog essays I’d like to write that revolve around Malcolm X and the making of this painting; but these will have to wait.) 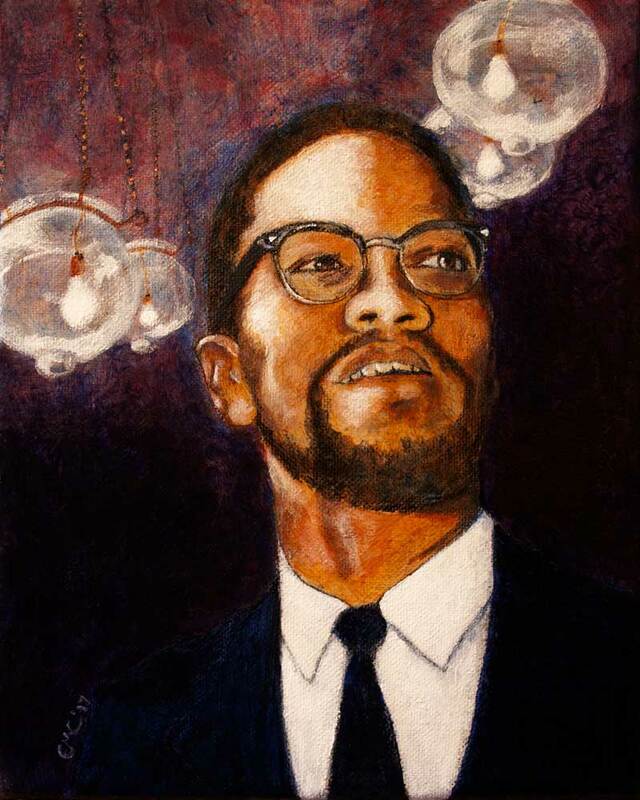 One reason I’ve placed this portrait in my “Transcendence” gallery is that I have always been moved and impressed by Malcolm’s ability toward the end of his life to transcend his initial “Black nationalism” to embrace a more universal and inclusive outlook and approach, especially following his pilgrimage to Mecca in 1964. Yes, please visit again. There will be many additions and changes to this website reflecting the tensions of our socio-political climate.